For veteran fishing guide Jason Muche, the open-water period’s early days mean finding places where lake-run ’eyes focus on warm inflows. On his home waters of Wisconsin’s famed Lake Winnebago Chain and Lake Michigan’s Green Bay, that means keying on tributaries such as the Wolf and Fox rivers. Sometimes this migration covers many miles. It’s also not uncommon for walleyes in large rivers like the Mississippi to swarm upstream into smaller rivers, where their migration stalls only when they hit an obstacle such as a low-head dam. 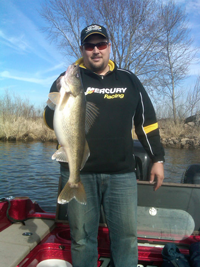 Shortly after the ice releases its grip on the lakes, when water temps hover in the mid to upper 30s, Muche goes to work putting clients on walleyes and saugers. He looks for areas where the fish pause during their upstream run. Holes, breaklines, wing dams and eddies or current seams adjacent to a bridge abutment or other current break are all potential drop zones. One of Muche’s classic scenarios is a breakline dropping from 4 to 10 feet of water, with a bottom structure consisting of clambeds, rocks or sand. “I jig right on bottom in 10 feet, close to the break,” he says. Muche’s main weapon is a ¼- to 3/8-ounce Lindy Jig. Size varies according to water depth, current strength and the skill set of the angler holding the rod. “The ability to maintain contact with the bottom and keep your line absolutely vertical are keys to it all,” he says, explaining that a heavy jig is easier for aspiring river rats to handle, especially in fast flows or deep water. Boat control is also critical. Rather than hover in one place and wait for walleyes to come to him, Muche moves downstream along the break. He uses the trolling motor to slip down-current just fast enough to keep the line vertical. Keeping the bow of the boat into the wind helps him with boat control. To hook the bait, he presses on the minnow’s gills to open the bait’s mouth. Next, he runs the hook through the mouth and out one of the gills, then slides the minnow up against the jighead. To complete the rigging, he runs the point from the bottom of the minnow alongside the spine and out just behind the dorsal fin. This keeps the bait lively yet secure on the hook. Muche’s jigstrokes hinge on the bottom composition. Dragging a jig in areas with rocks, wood and other debris results in frequent snags, so he executes a bottom-hopping cadence that mimics a minnow pecking at the substrate. Muche lets the jig fall on a controlled descent with no slack in the line. Drop the rodtip the same speed the jig is falling so the line is taut or bowing just a tad. This allows you to feel bottom contact better, which is very important because if you don’t feel the jig touch bottom, you’ll tend to keep letting out line until the jig is dragging way behind the boat and getting hung up. During the early season, bites are typically light. When he feels that sensation, Muche often pauses a second or two before setting the hook to give the fish time to take the bait. But if you feel a solid thunk, set right away, he says. As the water warms into the low 40s and the spawn draws near, Muche shifts shallower and adds small crankbaits to his repertoire. “Casting cranks into shoreline timber is a great big-fish pattern right now, because large females slide shallow and set up in the limbs prior to the spawn,” he said, noting that rocks and riprap banks can be hot, too. When working wood, Muche holds his boat just off the downed tree and fires casts into open pockets. Bring it back with a slow to medium retrieve. His favorite bait for such situations is a small Lindy River Rocker in shades of perch or polished gold. Other tactics also hold water for the early bite, including dragging minnow-tipped jigs over sand flats with the line at a 45-degree angle behind the boat.